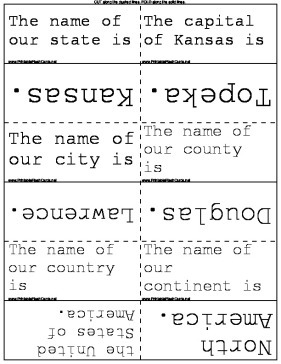 The facts about Kansas in these flash cards cover everything from the first governor to the state reptile. The name of our state is Kansas. The capital of Kansas is Topeka. The name of our city is Lawrence. The name of our county is Douglas. The name of our country is the United States of America. The name of our continent is North America. The state flower is the sunflower. The state bird is the western meadowlark. The state animal is the buffalo. The state tree is the cottonwood. The state reptile is the ornate box turtle. Rivers in Kansas flow east and southeast. The largest lake in Kansas is Milford Lake. Kansas is named after the Kansa or Kaw Indians. The word Kansas means people of the south wind. Kansas became a state on January 29, 1861. Kansas is 152 years old. Kansas was the 34th state. The governor of Kansas is Sam Brownback. The first governor of Kansas was Charles Robinson. Abilene, Kansas is home to the library and museum of President Dwight Eisenhower. Who fought to make Kansas free? Jayhawkers. The president of the United States is Barack Obama. The mayor of Lawrence is Bob Schumm.